Factory Sealed 2014 Topps Supreme Baseball Hobby Box mit 2 Cards per Pack. Zwei der folgenden Cards in jeder Box: Single Autograph Cards, Multi Autograph Cards oder Autographed Relic Cards. Produktinformationen "2014 Topps Supreme Baseball Hobby Box MLB"
Factory Sealed 2014 Topps Supreme Baseball Hobby Box mit 2 Cards per Pack. Jumbo patch autographed relic book cards and a multitude of 1/1s. - Green Parallel - sequentially #'d. - Sepia Parallel - sequentially #'d. - Purple Parallel - sequentially #'d. - Orange Parallel - sequentially #'d to 15. - Red Parallel - sequentially #'d to 10. - Black Parallel - sequentially #'d to 5. - Supreme Parallel - #'d 1/1. - Platinum Patch Parallel: sequentially #'d to 10. - Supreme Patch Parallel: #'d 1/1. - Platinum Patch Parallel: sequentially #'d to 5. 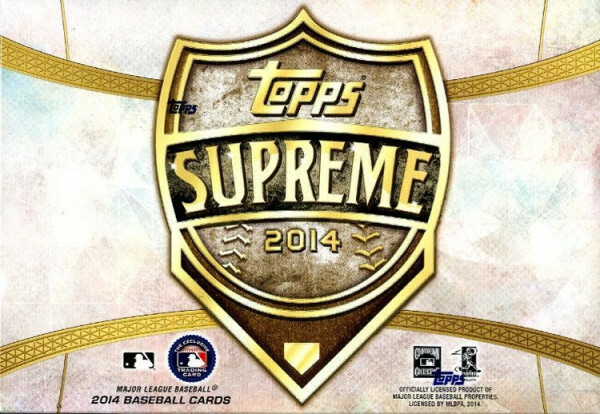 Weiterführende Links zu "2014 Topps Supreme Baseball Hobby Box MLB"
Fanbewertungen für "2014 Topps Supreme Baseball Hobby Box MLB"